Tigh Na Bruach Bed & Breakfast is located on the banks of Loch Ness within four acres of landscaped gardens with paths and bridges meandering down to the water giving unrivalled loch access to our guests. Guests have their own private covered veranda giving spectacular views of Loch Ness and the mountains beyond. Tigh Na Bruach caters for only six guests and is ideally suited to those looking for a Loch Ness Bed and Breakfast where comfort and attention to detail is our main priority. Free wireless internet access is available, and a shared laptop for guests use. For walkers and cyclists, we have drying facilities and secure storage for bicycles. Ironing facilities are available and packed or basket lunches by arrangement. Our dog Rowan (a black Labrador) is always happy to welcome new guests. However she is trained not to enter the guest areas and contact with Rowan is entirely at guests' request. There are many good and varied places to eat out using high quality local produce. Tigh Na Bruach Bed and Breakfast can offer advice and sample menus for many of those on Loch Ness or elsewhere in the Highlands. Tigh Na Bruach is located just outside the small village of Invermoriston on the western shore of Loch Ness. Invermoriston is built around the junction between the A887 (leading all the way to the Skye Bridge at Kyle of Lochalsh) and the A82 (connecting Fort William with Inverness). Due to our ideal location in the centre of the Scottish Highlands, you will have easy access to the most wonderful scenery, and popular visitor attractions. Day trips to the Isle of Skye, Fort William and Inverness and Nairn are popular with our guests. Plan a day trip on the Jacobite steam train (Harry Potter train) from Fort William to Mallaig (advance booking required, we can arrange this). Spend a day at Fort George and look for the dolphins on the Moray coast, or the beautiful Cawdor Castle and Gardens, and the amazing new visitor centre on Culloden Moor. We can help you plan long or short days out to make the most of your stay with us. If you fancy a relaxing day in that’s fine – sit on your veranda or in the gardens (binoculars supplied if you want to scour Loch Ness for any unusual happenings) read a book (we have a plentiful supply), fish for Nessie or we can even give you a fork and trowel if you fancy a bit of gardening! 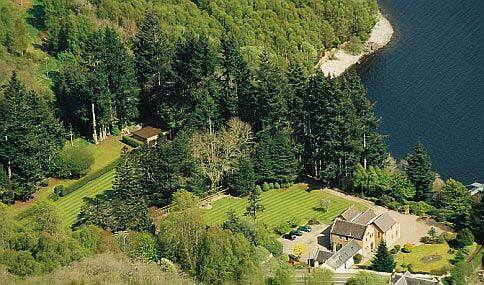 Have a look at our map to see our exact location on the banks of Loch Ness.